RAMARA — A robbery at a variety store on Hwy. 12 has resulted in three of seven suspects beging arrested who were considered dangerous. Police say that seven suspects entered the store in the Nov. 1 robbery on Hwy. 12. The Orillia Crime Unit along with Central Region Forensic Identification Services (FIS) and the Orillia OPP is asking the public to help identify the others. The suspects should be considered dangerous; police are asking citizens not to approach and call the police immediately if they see any of the suspects or the vehicle they are operating. The Orillia OPP are investigating the robbery, where a firearm, substantial amount of cash and jewelry were taken. The cash and jewelry were in a small safe. On Nov. 1, at 6:20 p.m. seven persons entered the business. The people who entered the store distracted the clerk while others entered the residence and business area. 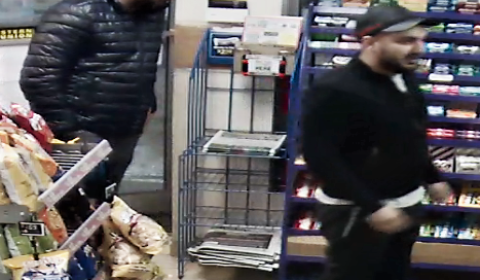 Surveillance photos show a number of the suspects and a vehicle they arrived in, a newer model white Dodge Caravan with no front license plate. — Female – Medium to thin build dressed in a dark full-length dress and donning a black scarf which covered her face. Several suspects diverted the attention of the clerk. The are considered dangerous. The Orillia OPP would like to remind business owners to be vigilant as these types of thefts are becoming more common. Large groups of people enter the business when there is minimal staff. The people will then distract the worker while others enter the back rooms, residence or safe areas and rummage for cash and valuables. Employees should work with a partner and/or have a communication device close at hand to be able to call for assistance if needed. On Nov. 27, 2018 the Orillia OPP Major Crime Unit and Community Street Crime Unit (CSCU) assisted by, York Regional Police Service (YRPS) District 5 Property Crime Unit, York Regional Police Service Emergency Response Unit (EMU), The Royal Canadian Mounted Police (RCMP) and Canada Border Service Agency (CBSA) executed a search warrant at a Toronto area residence. As a result of the search warrant police arrested, 23-year-old, Alina Nistor of Scarborough; 27-year-old, Martin Tomescu of Etobicoke; and a youth who cannot be identified under the Youth Criminal Justice Act (YCJA). All three were charged with theft over $5,000 Contrary to Section 334(b) of the Criminal Code and Break and Enter Contrary to Section 348(1)(b) of the Criminal Code in relation to this incident. The youth was released on a promise to appear and an officer in charge undertaking. The adults were remanded into custody and scheduled to appear, on Monday Dec. 3, 2018, for a bail hearing at the Ontario Court of Justice in Barrie. They ask that anyone who locates a safe or if anyone witnessed this incident or has information that could be useful to contact the Orillia OPP at 705-326-3536 or 1-888-310-1122. The other suspects entered the residence behind the store and stole a safe with jewelry and cash in it.